Once the world's largest mobile phone manufacturing plant, Nokia's Tamil Nadu factory is now terminally ill. The riveting tale of its rise and fall. Tragedy struck S. Priya, 24, twice in 12 months. At 17, she had been married off to an auto driver in Thiruthani, a temple town 91 km from Chennai. He did little work and drank a lot. 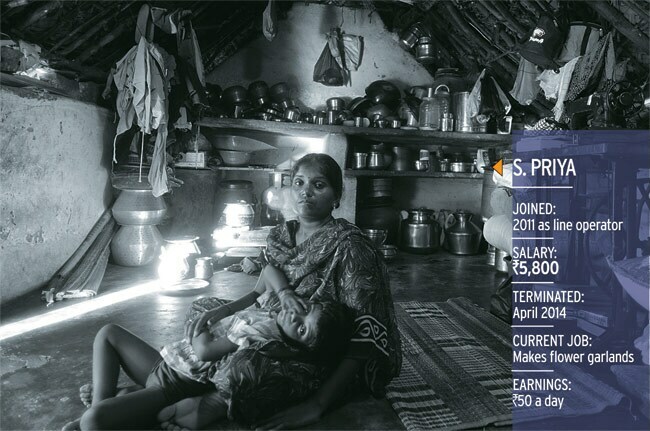 After Priya gave birth to a boy, she was forced to start looking for a job. The world's second-largest mobile phone maker, Nokia, was hiring. Priya applied. In 2011, at the company's factory in Sriperumbudur, she passed hand-eye coordination tests-her nimble fingers were good enough to assemble phones - and was taken on as a trainee. The monthly pay cheque of Rs 5,800 bought her quality rice at Rs 30 a kilo. But her joy was shortlived. In April 2013, her husband died of jaundice. Then, on April 15 this year, after Priya had finished her regular shift and swiped out of the factory gate at 2.30 pm, her access card was taken away by a supervisor. "You needn't come back," he said. Priya, all of five feet with knotted hair, stayed calm. But many others whose services at the same plant were similarly terminated, wept. Some 750 trainees were sacked that day and the next. Hundreds of contract workers had been fired in previous months. On April 10, the company had also announced a voluntary retirement scheme (VRS) option for permanent workers. About 5,000 employees have taken advantage of the scheme, realising the factory's fate is all but sealed. At its peak, Nokia's Sriperumbudur factory was the world's largest mobile phone plant, with 8,000 permanent employees working three shifts, producing more than 15 million phones a month. Today, a little over 1,000 employees remain, while monthly production is down to two million units. Part of the reason is Nokia's falling global market share, down to 11.3 per cent in the first quarter of 2013/14 from 14 per cent in the corresponding quarter a year ago, according to IDC. In 2010, the company lorded over 29 per cent of the market. But the main reasons are two crippling tax disputes with the Indian authorities, for a whopping total amount of Rs 17,658 crore, which has led the company to shift production to a new factory it has set up in Vietnam. The tax disputes have made newspaper headlines, led to courtroom battles and hectic parleys with the government, but still remain unresolved. Yet behind all these, also lies a story of shattered dreams. Employees have lost their livelihood, while India's reputation as a manufacturing alternative to China has been severely dented. It was all very different on December 1, 2004 when Nokia first announced its decision to set up a plant in India. 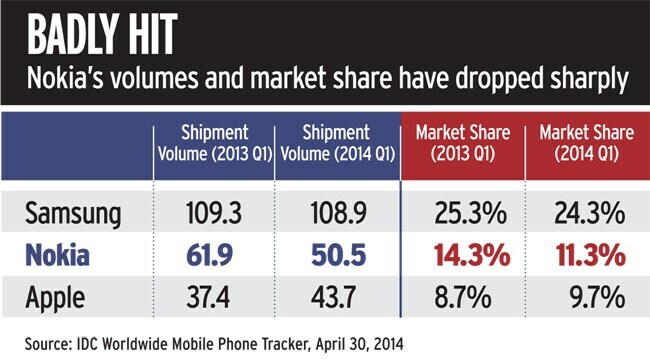 Till then, it used to import all handsets sold in India from China. "India was doing about a million phones a month at the time," says a former Nokia executive who does not want to be named. "Nokia wondered how it could make this a six to seven million a month market. The answer was local manufacturing." An Indian facility meant lower logistics costs, less time to hit the market, more flexibility. No longer would executives have to get in touch with the China factories for small design changes which took nearly three weeks to be executed and products shipped. When Nokia revealed it was scouting for a manufacturing destination in India, many state governments - Haryana, Andhra Pradesh, Uttarakhand, Karnataka and Maharashtra, along with Tamil Nadu - competed to woo it. Nokia was then the world's largest mobile phone maker. Tamil Nadu moved the fastest and won the race. Chief Minister J. Jayalalithaa saw the news clippings and is said to have commanded her babus: "Go, get Nokia." Within two days of Nokia's announcement, Tamil Nadu officials were in Delhi, making a presentation before its executives. Sure, Tamil Nadu's alacrity was not the only reason it won. Sabyasachi Patra, who handled Nokia India's relations with the government between 2005 and 2011, explains why Sriperumbudur was finally chosen. Maharashtra lost out because of traffic congestion in Mumbai and Karnataka, due to Bangalore's poor infrastructure. But Patra acknowledges the Tamil Nadu bureaucrats' role. "They made a good presentation," he says. "That kind of dialogue was not happening elsewhere." Just what kind? One of the bureaucrats involved in the discussions throws some light. "We understand the mind of investors," he says. "Never say 'No problem' to them. That sort of smugness plants doubts." It also helped that the leading political parties of the state united to welcome Nokia. "The reason Tamil Nadu got the plant was the strange, combined support of both Dayanidhi Maran of the DMK (Minister of Communications and IT at the Centre at the time), Jayalalithaa of the AIADMK who was chief minister, and the Congress which led the ruling coalition at the Centre. It had everybody's blessings," the former Nokia executive says. Nokia signed a memorandum of understanding with the Tamil Nadu government on April 6, 2005, to set up the plant in the Sriperumbudur Special Economic Zone (SEZ). It invited seven of its ecosystem partners to invest. Production started in 2006. The factory quickly exceeded expectations. Nokia initially committed to an investment of about $150 million for five years. Its cumulative investment now is $300 million. "Nokia went way above what it had promised," says the former executive. Initially, the plan was to make three to four million phones a month and export to neighbouring countries. Nokia ended up producing 15 million phones a month and exporting to over 80 countries. It was one of the largest foreign exchange earners for the country in the technology sector, exporting phones worth more than $2 billion a year. Nokia India's overall turnover totalled Rs 151,000 crore between 2005/06 and 2011/12. Around 72 per cent of the Nokia plant's employees were women. Indeed, the job with Nokia transformed the lives of many of the women, most of who were from poor families - young high school pass outs taking up their first jobs. "We realised the importance of Nokia not only from the narrow angle of employment generation but also through the change it brought about in the employees' lives," Patra says. Take for instance, R. Rajalakshmi, 27, who joined Nokia as an operator in July 2006. She started on a salary of just Rs 3,400 but by 2013 was earning nearly six times as much. She won company awards in 2010 and 2012 for her excellent performance. Her income funded the education of two brothers. It also enabled her to buy a plot of land in the temple town of Thiruvallur where she now lives. Or take P. Umamaheswari, 21, who was working as an insurance agent after finishing high school and who joined the factory in August 2012 as a contract employee. She drew a monthly salary of Rs 6,200, enough to enable her to buy 16 grams of gold within a year, and get a borewell dug at her home. The plant's success attracted attention. The then prime minister Manmohan Singh, United Progressive Alliance Chairperson Sonia Gandhi, and seven union ministers, including P. Chidambaram and Dayanidhi Maran, visited in August 2007. "They spent about three hours. Chidambaram played interpreter. Sonia Gandhi was very keen to know about working conditions and salaries and how the women were trained," the former Nokia executive who hosted the min-isters, says. Academics were impressed too. Robin Jeffrey, research professor at the National University of Singapore and author of Cellphone Nation - which analyses the social transformation mobile phones have brought about in India - visited the plant in 2010. "For the young women working there, it was an experience unlike anything their forebears would have had. They were becoming relatively independent, wage-earning individuals, thrown together with scores of unknown people," he says. He rates it a fine example of benign capitalism. Both Rajalakshmi and Umamaheshwari's success stories, however, have tragic sequels. Rajalakshmi was expecting her salary to touch Rs 25,000 next year, but having seen the way the wind was blowing, decided to take advantage of the VRS scheme. She got severance pay of Rs 5.5 lakh but has no job now. Umamaheshwari was retrenched on January 10 this year and is back to being an insurance agent. What went wrong for Nokia, when and why? Ostensibly, the going was mostly good till 2012, though some maintain that discontent was simmering. "It was a strange happiness layered on hardships," says Madhumita Dutta, a researcher who has worked with the Nokia employees. "There were strikes. The work was monotonous and repetitive. There was a rest area for pregnant women but none for the men. They would sit on the toilet floor when they wanted a break." The salaries were initially frozen for a year, which created further resentment. In 2010, a 22-year-old mobile assembly operator, Ambika, died in an industrial accident, when her head got trapped in a robotic loading machine. The success also attracted attention of the wrong kind - from local politicians. A DMK-backed labour union gained ground around 2010. "Political parties wanted a foothold in the company because they saw the employees as a vote bank. A big name like Nokia also meant influence and power. Politicians started asking for scrap contracts," says Patra. Nokia did not oblige - scrap was e-auctioned according to an established procedure. Local politicians also wanted free mobile phones from time to time. Patra maintains Nokia ignored them. Did the tax cases that followed have anything to do with Nokia's unwillingness to kowtow to local politicians? No one is sure. But in February 2014, the Tamil Nadu Sales Tax department accused Nokia of not having exported any of the mobile phones it manufactured at the plant between 2009 and 2011. It maintained they were sold locally and were thus subject to sales tax of Rs 2,400 crore, which Nokia had not paid. "We find this claim surprising since we have customs documentation showing we exported more than 400 million phones in that period," says James Etheridge, Head, Corporate Communications at Nokia, in an emailed reply to Business Today. "We were also granted several export awards over those years to recognise our contribution to Tamil Nadu's economy by way of exports. Unfortunately, local authorities have been reluctant to see this documentation and give Nokia a hearing so we can present this information." The Madras High Court has set aside the Sales Tax Department's demand. It is the second tax dispute, however, which is far more serious. It is a demand from the Income Tax Department for Rs 15,258 crore in unpaid taxes, interest and penalties. It relates to Nokia's import of software from its head office in Finland. Nokia India showed the payments made for the software as 'purchase transactions', not 'royalty payments'. Thus the payment was made without keeping back any withholding tax. "In a purchase transaction, concluded outside India, there is no tax liability in India. The payer is not required to withhold any tax in India," says Sanjay Sanghvi, Tax Partner at Khaitan & Co.
"Tax authorities, however, have taken a different view. They feel these were royalty payments and Nokia India should have deducted tax. They are treating Nokia as a defaulter." Tax officials say they first noticed defaults in January 2013. When Nokia wanted to sell its Devices & Services business to Microsoft, they disallowed the transfer of the Chennai plant, freezing its assets. Nokia says the IT Department's claim is based on a unilateral interpretation of the Finland-India Double Taxation Avoidance Agreement (DTAA). "The Indian view runs contrary to the views of the Finnish government and has raised concern within the international community. The DTAA states that business income is taxable in a company's country of residence, and Nokia has, accordingly, paid all taxes due to Finland," says Etheridge's email. Nokia has now entered into a "limited period service agreement" with Microsoft to use the factory as a contract manufacturing facility. The long term future of the facility depends on the resolution of the tax dispute. "If the dispute continues and Microsoft's requirements change, there could be a shutdown," says a Nokia spokesperson. "If the assets are unfrozen, we can look at alternative solutions, such as a sale to ensure the long term viability of the facility." The uncertainty has led Nokia to ramp down the Chennai plant and shift production to a new factory in Vietnam. "Who benefited? Vietnam. The Vietnam plant may be producing around eight to 10 million phones now. The ecosystem players are ramping up in Vietnam," says the former executive. 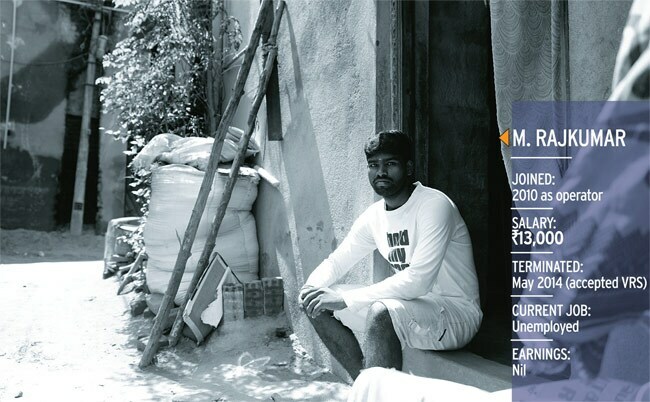 Jobs created in Vietnam have been at Chennai's expense. Nokia did not respond to Business Today's questions on jobs created in Vietnam, the current production in Chennai and the number of trainees sacked between April 14 and 15. The rise and fall of Nokia's Sriperumbudur plant raises larger questions about India's attractive-ness - or otherwise - as a manufacturing destination. "Our tax dispute and its longevity will impact how other global players look at the Indian market for electronics manufacturing," says the Nokia spokesperson. "Investors want stability wherever they choose to invest and they are closely monitoring our case in that context." Given Nokia's experience, why would anyone set up an electronics plant in India when China, Taiwan and some East European countries are established destinations? "The message investors seem likely to take away is that no one is safe from the demands of Indian government agencies, once the deals are done," says author Jeffrey. Many industry watchers are baffled at the silence of both the ruling AIADMK and the DMK in the matter. "Neither the AIADMK and the DMK cares about the welfare of the workers in the state," says Communist Party of India leader A. Soundararajan, who is also honorary president of one of the unions at the plant, the Nokia India Thozhilalar Sangam. The CPI, he adds, held protests and rallies to draw attention to what was happening, but no one listened. The Nokia management is aware that many of the former workers are struggling to find employment. It has started a "Global Bridge Programme" where employees who took the VRS option are trained in different skills. There are plans for job fairs as well. Naturally, life has got much tougher for the terminated workers. Priya for instance, has moved in with her parents - all living in two tiny rooms with thatched roofs. From assembling phones, her nimble fingers now stitch flower garlands which earn her around Rs 50 a day. "I was hoping I could settle down with my Nokia job," she says. "Now I'm waiting for some reskilling." Her five-year-old son, Gokul, playfully climbs on to her lap. "I only dream of my son's education," she adds.